Forest Garden 8 x 6 Overlap Pressure Treated Reverse Apex Shed: This Forest Garden shed features a reverse apex design meaning that the ridge of the roof runs from left to right rather than front to back, this allows for plenty of central head room and allows the front longer side of the shed to house the single door and window. This garden shed has been pressure treated in the factory to give it a long lasting rot resistant finish that will last you for many years. This shed has several security benefits such as double Z framing on the door for added strength, secure hidden hinges and virtually unbreakable polycarbonate glazing. The timber on this shed has a rough sawn finish and consists of mixed softwood overlap panels which are square cut to assist rainwater to flow off the side of the building furthermore the wood is FSC certified from a sustainable source. This shed has a hasp and staple lock to secure the door and the windows are fitted using security screws. 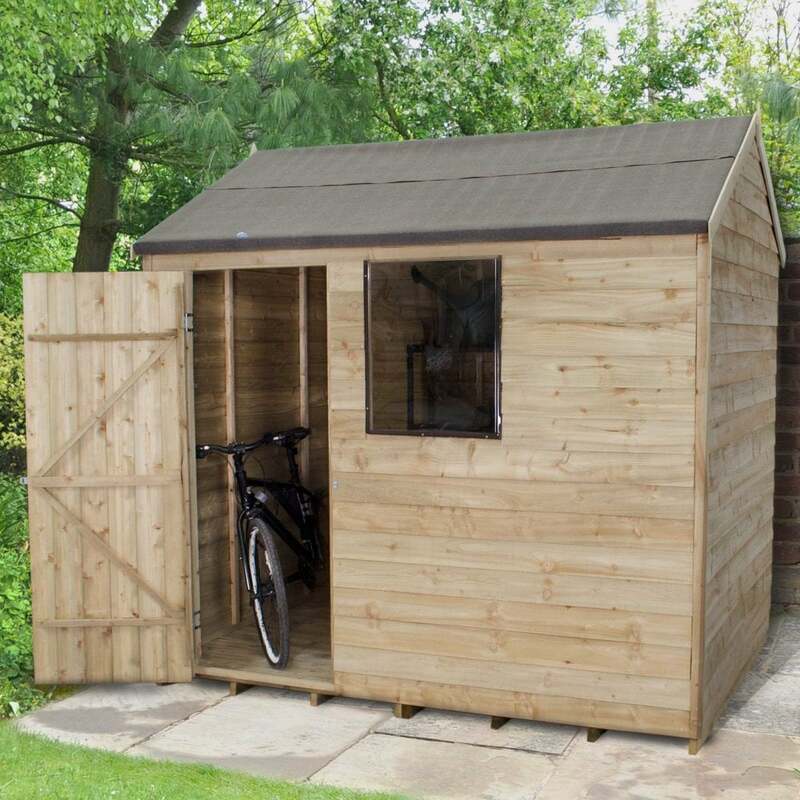 This shed is delivered to you flat packed for easy self-assembly and includes a 15 year guarantee against rot and fungal decay.